Until a few years ago, it had never occurred to me that there existed a universe that extended beyond the idli-sambar, puttu-kadala and appam-stew into Bheeda Par Eeda, Kanda Bajji, Dhansak, and Sali Boti. It was only when I started exploring food, and its many exquisite possibilities that I came across these gastronomical delights. Ever since it opened I had heard interesting reviews about this Parsi restaurant in town, and most of them raved about the food – the Berry Pulao, the Dhansak or the Shrewsbury biscuits. So I, with a few of my friends, decided to try out this restaurant and find out firsthand if this place deserved those reviews. We ordered the Sekanje Bin (a Persian-inspired drink made from dried plums, mint and jaggery) for our drink. It came in milk bottles, which I thought was an innovative way to serve a drink…. It tasted both sweet and tangy. Among the starters, we settled for the “Aloo Aunty‘s Vegetable Cutlets” which were quite big and delicious. One serving had three cutlets. It had a potato coating with a finely chopped vegetable filling. And the tamarind chutney served with it was the perfect combination for this starter. For the main course, we ordered the vegetarian “Dhansak” for our vegetarian friend and the “Mutton Berry Pulao” for the carnivores. 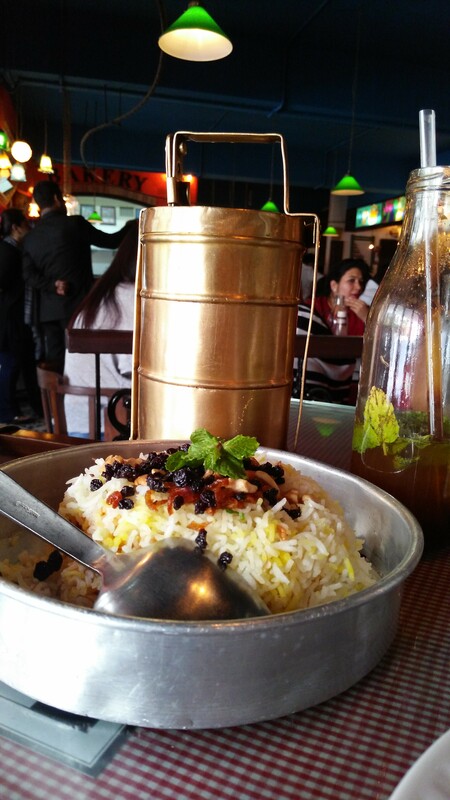 The “Dhansak” came in a three-tier tiffin dabba – it had a simple rice pulao in one tier, a cucumber, onion salad in the second, and the “Dhansak” in the third. The “Mutton Berry Pulao” came in an aluminium cake tin. It had a tender mutton curry layered with Biryani style rice and was topped with berries, raisins, cashew nuts, and fried onions. Both these dishes did not disappoint. They were mildly spiced – I’m used to my food being spicier, but this was perfect for a warm afternoon. The Mutton in the Berry Pulao was tender and well marinated. And the berries gave it that slightly sweet flavour which I so love in Biryanis and Pulaos. We were pretty full by the time we finished with the main course, but it would have been a sin to leave without having dessert. So we ordered the “Toblerone Mousse”, and the “ English Pound Cake”. I wanted to have the “Irani tea”, but didn’t because I wasn’t sure of how my stomach would react to a tangy drink and then a tea on the same afternoon. The “Toblerone Mousse” was rich, dense, and yummy. The “Pound cake” was just the right kind of sweet – I was rueful that I didn’t order the Irani tea which would have been perfect with it. The whole meal of one drink for each, two starters, two main courses, and two desserts cost us about Rs. 2500/-. The service was good. Our waiter was very polite. He did offer his suggestions on the specialities of the restaurant.